As the time progresses, every individual comes up with an idea or vision for better future. So, they start developing their ideas with the help of their newly established company or firm. But clearly, your startup company isn’t performing in a way it is supposed to. Are you looking for a dependable way to give your startup business a dream start? Effectively promote your new business ideas and brand name as it gives high delivery rate. Facilitates ease of access as it is 100% responsive and can be viewed on any phones, tablets, and laptops. Reduce your workload as mass email templates transmission is a fully automated process. To save your precious time, we have put together a list of best startup email templates for entrepreneurs, new business, etc. so that you can choose the most apt and start your email marketing. 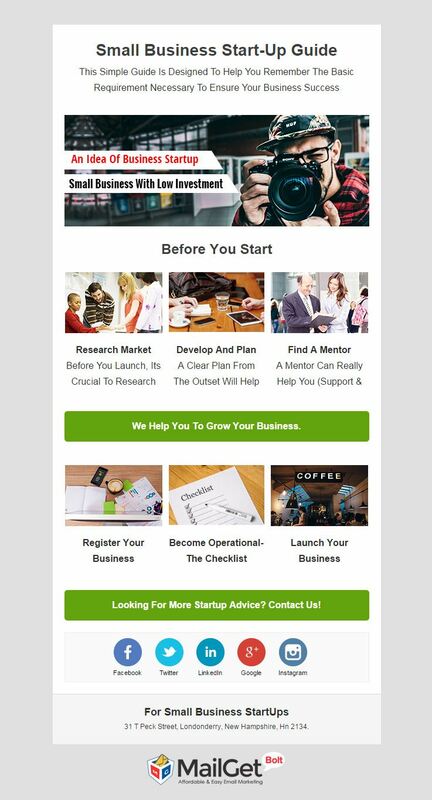 9+ Best Startup Email Marketing For Beginners, New Businesses & Financial Startups will help you in formulating the best marketing schemes and strategies, ultimately leading to much greater brand exposure. 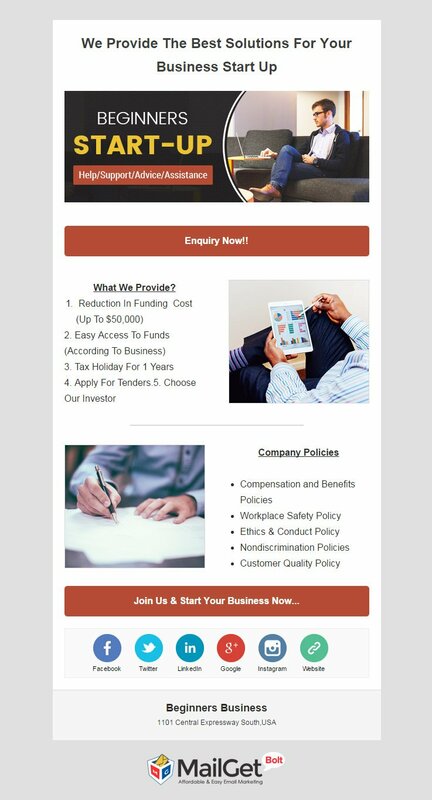 This email template is built with the sole purpose to give your startup business a desired start and help you get a decent place in the business arena. The template is crafted with a powerful tool, drag & drop builder, which not only makes the e-templates responsive but also helps in quick template constructions too. 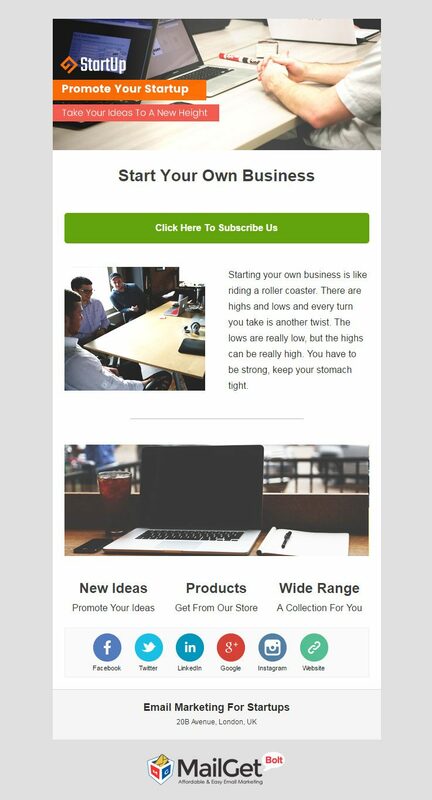 All the entrepreneurs and small business owners can use this email template in their promotional activities for better results. The e-template allows you to track its status like open, clicked, etc with the help of email tracking mechanism. With the effective monitoring of your e-template, you can formulate different e-marketing strategies for greater yield. 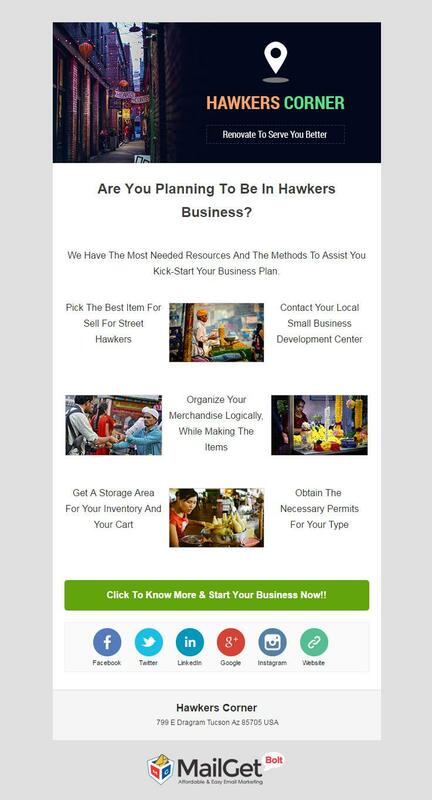 Through the mass transmission of this classy email template, you can inform your potential clients about the new upcoming hawkers’ point of the city. You need not have to worry about the deliverability issues as the e-template is blessed with the mighty 99% delivery rate. With this much success rate, you are bound to be the new talk of the town. 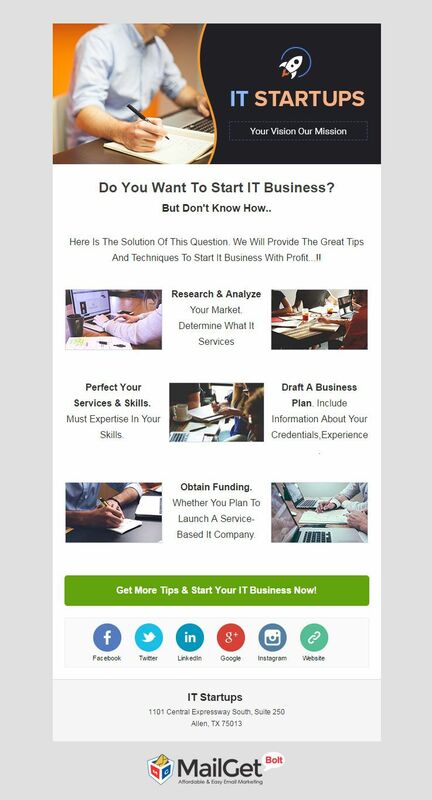 Prepare to generate a large audience who seeks IT related advice by sending informative and promotional email templates. The e-template helps you to create a greater credibility as it helps you to segmentize your subscribers. 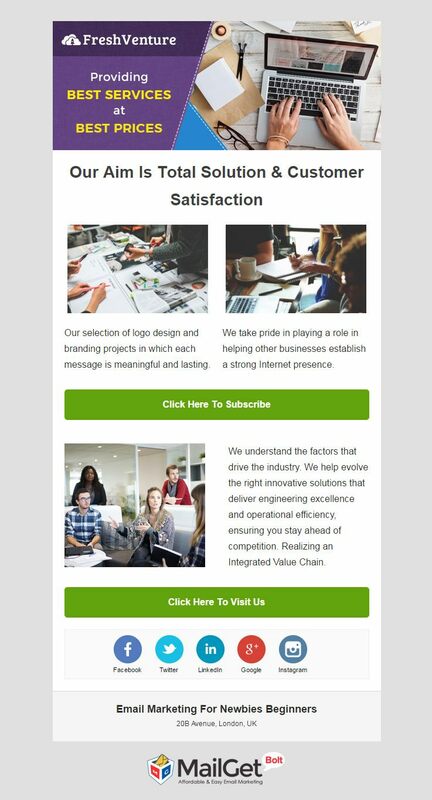 This ensures that you are sending relevant and different informational newsletter to the corresponding IT solution seekers. With the proper use of this e-template, you can not only promote your brand name but also help in providing the amenities that you are working for. 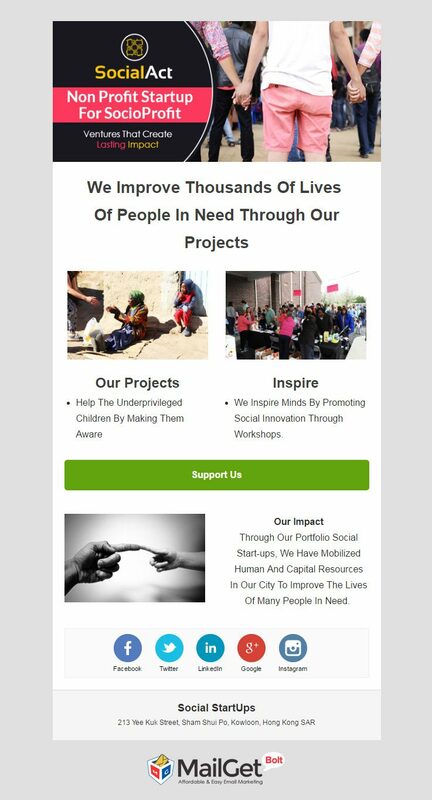 The email template allows you to maintain a healthy list of email addresses with the help of list management feature so that you can spread across the mission and progress of your social startups. 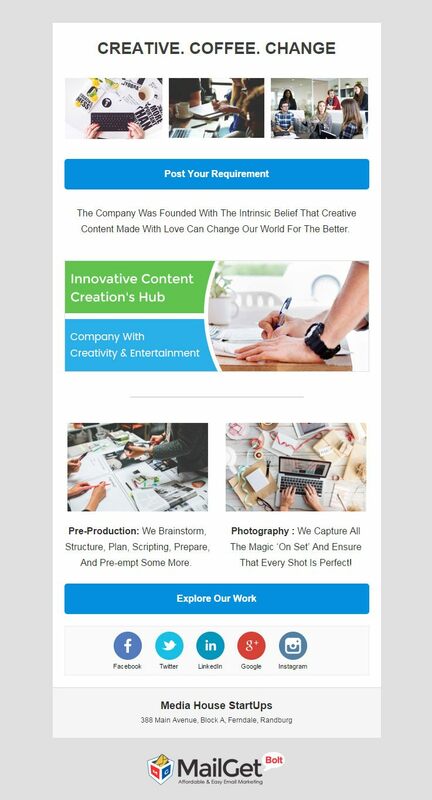 Make a grand entrance in the media production business by sending tempting and intriguing email templates to your potential clientele, informing them about your services. As the media production takes a lot of time, you can devote your time away from promotional activities by sending email templates through drip emailing mechanism. All you have to do is set a triggering date/time on email campaigns. 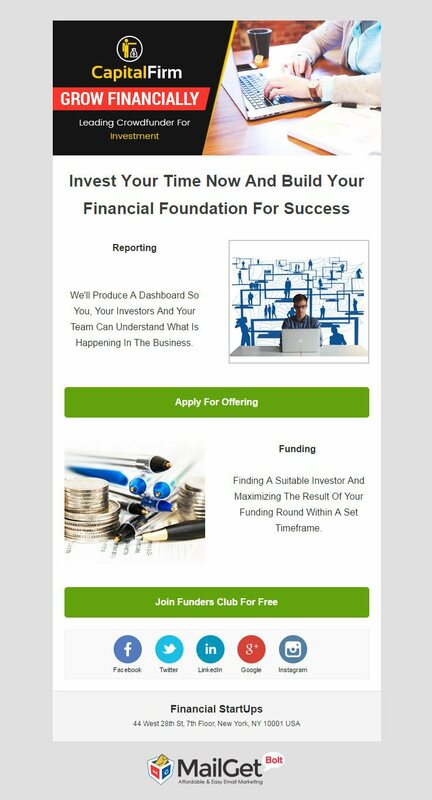 Entice your new clients to invest in your scalable startup by sending charming email templates and educating them about your company’s goals and ambitions. The email template facilitates you with the auto-transmission process, one of which is email scheduling. This function allows you to schedule your email templates to get transmitted on certain date and time so that it is more likely to get noticed. Foster a long term relationship with your new clients by keeping them informed about your financial services and new financial plans through the regular e-template transmission. Just like other templates, this e-template is also integrated with another automated mechanism – auto responding emails. This is usually activated by user action which in your case could be successful sign ups and payments, etc. Begin the journey towards success by adding email templates in your marketing strategies as it guarantees maximum exposure for your brand and services. This e-template allows you embed a subscription form in the template’s layout, for the purpose of collecting various leads. These leads can turn into loyal customers by staying in touch with them through email templates. Instigate the use of promotional email templates in your new business’s marketing campaigns and enroot yourself in the business world. You can create a personal correlation with every new client by addressing them with their names and create a long term relationship. This can be achieved by attaching few generic taglines of the personalization tags feature. 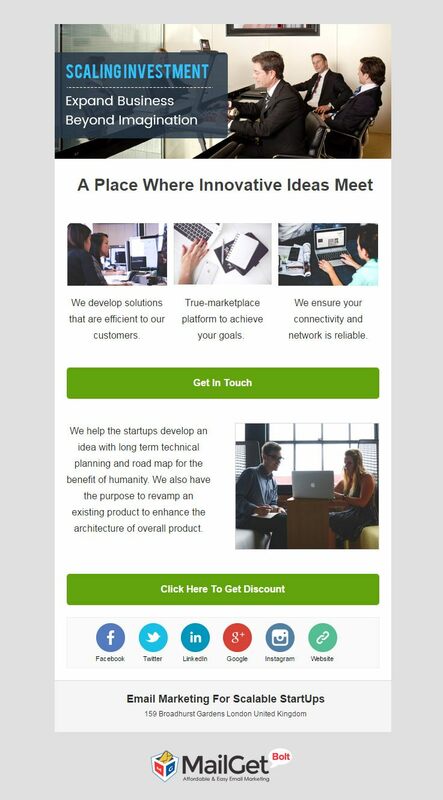 By using these above-listed email templates in your e-marketing campaigns, you are guaranteed to achieve the desired goals and establish a credible brand name. Are you looking for a way to design a fresh email template, you can definitely do it using MailGet Bolt, just sign-up for free.